It’s that time of year again; Cupid is getting his bow and arrow ready for Valentine’s Day, a traditional day of love. Valentine’s Day comes with two things; First, romance, and second, plenty of sugar in everything you eat or drink! For romance, you need a great attitude, happy smile, good breath, and a kissable mouth. For sugar? You need to be careful. Classic treats like boxes of chocolates and bottles of sweet wine make for a tasty and romantic date, but they can also lead to dental problems. And while we wouldn’t blame you for forgetting about oral health on a date, that doesn’t mean you shouldn’t consider your overall and dental health at all times. 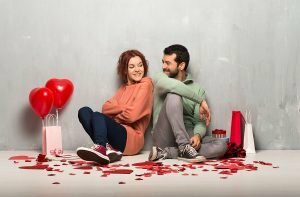 To keep you happy in love and smile, A Plus Dental has put together a list of Valentine’s Day Tips that can help you in both categories. Whiten your teeth! Nothing makes lips more attractive than a pearly white smile. Sparkling white teeth are the perfect match to kissable lips. So if your smile is yellower than you’d like, there are plenty of teeth whitening options available, including over-the-counter products, in-office dental bleaching and at-home bleaching kits. But there is only one treatment that can dramatically whiten your teeth in one visit, in time for Valentine’s Day – Zoom Teeth Whitening! Philips Zoom WhiteSpeed is the most advanced teeth whitening procedure that can be performed at the A Plus Dental office. It’s perfect for anyone seeking immediate results, and now with the most advanced LED-whitening technology, the results are even better than ever. Philips Zoom WhiteSpeed not only whitens teeth up to eight shades, but it’s safe as well. Other whitening products can harm teeth and gums; using Philips Zoom WhiteSpeed gives you greater lustre and protects enamel. Beware bad breath. Bacteria are the primary culprits in bad breath, so good dental habits like brushing and flossing are crucial. Other ways to stay fresh are over-the-counter antimicrobial mouthwashes or chewing sugarless gum. Kiss More. Kissing helps prevent cavities! When you kiss someone, it stimulates saliva in your mouth, which breaks down plaque and washes bacteria away. Be careful with sugar! Valentine’s Day is right up there with Halloween as a threat to teeth! That’s all because of the candy, fatty foods, and sweet drinks. People of all ages swap treats on Valentine’s Day, and many dates include wine and sugary desserts. But how can you keep your teeth healthy when they’re drenched in sugar? It’s probably not realistic that we can entirely avoid sugar, but moderation is a great approach to all sugary foods. Even then, be sure to rinse your mouth with water to wash sticky residues away. If you want to avoid gum disease and cavities, think outside that heart-shaped box and buy non-edible Valentine’s Day gifts. Not all chocolate is equal. If you are buying sweets or chocolates on Valentine’s Day, solid chocolates (the ones without chewy or sugary centres) stick to the teeth less than chewy treats. Dark chocolate is the best option as it contains lower sugar levels than milk chocolate. Stay away from sticky foods. Avoid hard candies, gummy candies, and sticky caramel, which are terrible for teeth. Instead, give a card, flowers, or a romantic dinner. Sweets at the proper time. If you can’t stay away from sweets, enjoy them after a meal to lower exposure to sugar and bacteria. Also, be sure to drink water and practice a good, thorough hygiene routine afterwards! Valentine’s Day is a great holiday, and at A Plus Dental, we hope you go out and enjoy it. But as you do, spare a small thought for your dental and general health. The better condition your smile and health is, the more likely you are to enjoy many Valentine’s Days in the future! 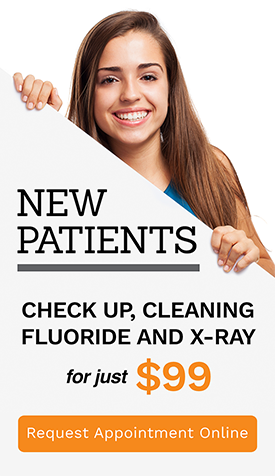 When you choose A Plus Dental, you take the next step towards a beautiful, healthy smile with teeth that feel great in your mouth!